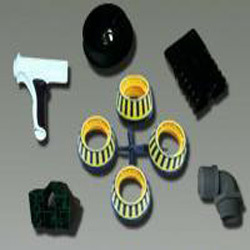 We have come up with superior quality plastic molded parts that are made as per the exact requirement of clients. These plastic moulded components are available in different dimensions and sizes as per industry standards. We are capable of fulfilling the bulk requirements of clients. We offer these parts at reasonable prices. Backed by a proficient manufacturing unit we offer our clients a wide range of Plastic Moulded Parts. These plastic moulded components are available in molding capacity of 150 grams P/P. T5. The material used for manufacturing our products include P/P, P.C., Polycarbonate + 30% Glass, Norway, Norvl + 30% Glass, H.D, L.D and Hand Poll, Nylon PU. Looking for Plastic Moulded Parts ?